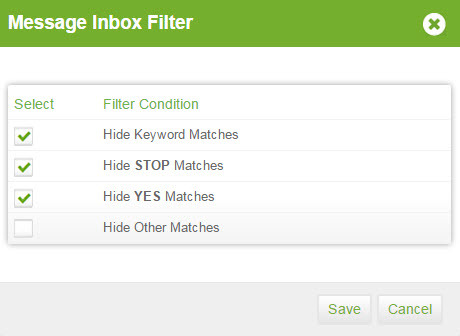 Because your message inbox displays all inbound text messages from contacts, you may want to use filters to display messages from contacts that are meaningful to you. For example, you may want to hide all Keyword Matches, STOP Matches, and YES Matches to only show Other Matches. Hide Keyword Matches - Hides any responses from contacts that exactly match any keywords that have ever used in campaigns e.g. Disney, MOBIT, Pizza, NFL. Hide Other Matches - Hides any other responses from contacts that doesn&apos;t match the above three filters i.e. a keyword, stop or yes response. 1 - Click on your filter icon. 2 - Edit your selected filters, then click Save.